I’m very interested to see how this shapes up and what they do with it. I did a tiny bit of work on a rival bid for the tender and it is the very definition of budget TV, each two hour episode costing an absolutely tiny £14k to produce. The big problem Princess had was that they were having to pay the studio crew for a full day’s rate but they only actually needed them for half a day of work given that the show finishes before 12. ITN can get around this by using the same crew on the 5News bulletins, freeing up a bit of that tiny budget for things as basic as a few licensed images or perhaps the odd commercial track. Hopefully Lost in TV will be able to find a decent range of punters for the audience, having watched a month’s worth of shows I got very used to seeing the same three middle aged transgender women and an elderly woman with no teeth in the audience every single day. Even back in the MTV studios days, Princess had a bank of regulars who lived in the locality who'd turn up daily for the food pre-show! I wonder if they took advantage of that when they made Mel and Sue's chat show in the afternoon? 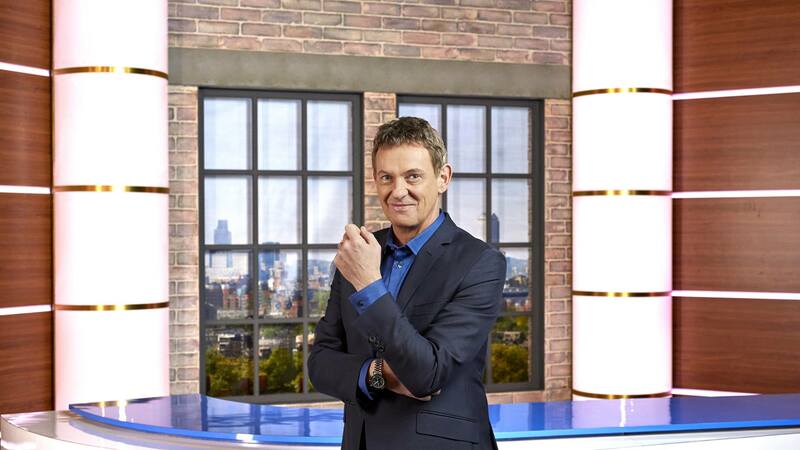 From The Wright Stuff’s Facebook page, a shot of the new set, appears to be a dressed up 5 News set. Fake bricks? Some members definitely won't be fans of that. It looks a bit US local news set to me but I'll reserve judgement until I see the full thing. Didn't they have the panels of fake bricks before? I'm personally not a fan and thought that we'd steered away from them in recent TV set design but as long as there are other elements it should be fine. My concern is how it will affect the 5 News set, or does that set not take up much room in the studio? Is the windowframe casting shadows on the fake view of London too? Very much copies the ‘interview area’ of Good Morning Britain’s set, in my opinion. Looks more like Price Drop TV with Matthew Wright. If the image on the backdrop could have been reversed though. Trees in the foreground leads me to think it was the top of Hampstead (Parliament) Hill. But could also have been done as a composite view of the skyline as well. A tiny look behind the scenes. Appears the music is being kept.